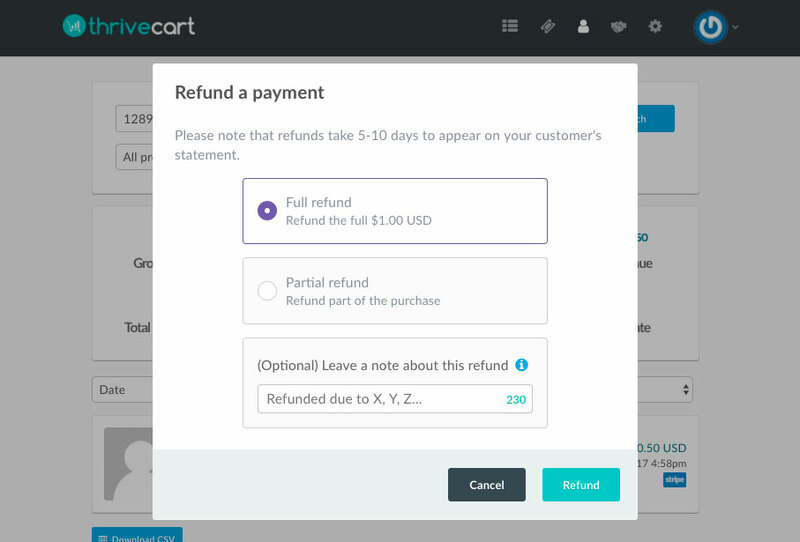 ThriveCart offers you the ability to issue full or partial refunds on your transactions. You do not have to worry about losing your entire sale if a partial refund could help save your customer. The first thing you need to do is head to your transactions area and locate the transaction you want to refund. Once you’ve located the transaction you want to refund you need to click on the refund button. You’ll be presented with a modal window with the choice of refund you want to process. You can choose from a full refund or a partial refund. When issuing a partial refund you can refund multiple times up to the total transaction amount. You cannot refund more than the initial transaction. You’ll also have the option to leave an internal note about the refund. So if you’re reviewing your transactions in the future you can read your notes to see why that refund was issued (hover mouse over the refund text). You will also see the refund show in the transactions once processed. Note, that when refunding a subscription payment the subscription itself is not affected (even if it’s the initial payment). Refunding a transaction does not affect the customer’s subscription. You can view the article here on pausing subscriptions, and here on cancelling subscriptions. If you have any questions you can also contact the support team directly here.